You are here: Home » Fly through Beach Bar, does it really exist? Yes, yes it does, well sort of. One of my favorite destinations is the Island of St. Marrten or St. Maarten depending on what side of the Island your on. Yes, depending on which side of the Island. Scott, why does that matter? Well I am glad you asked. The Island of St. Marrten is actually an Island that belongs to TWO different countries, France and The Netherlands. So in the Island of St. Marrten, you have a Dutch Side and a French Side. They are distinct, meaning if your observant you can notice when you travel from one side to the other. Now, it is not necessary to have a passport and stop at a check point to get around the Island. On the French Side, they pay Property Taxes for example, which on the Dutch side they do not. This shows in the roads you travel, the homes you see etc. The French Side also seems to be a bit more sophisticated and stuffy. But they also have some of the finest beaches and restaurants. The two towns that seems to be the most recognition are Grand Case and Marigot, both are lovely towns with access to great beaches, restaurants, great hotels and resorts along with pretty good shopping. The Dutch side is what I call the Fun side. I believe it is less expensive to stay and play on this side of the Island. There are plenty of Restaurants, Casinos, Shopping, Hotels, Resorts Beaches. But there is a funner atmosphere, like spring break for people with a bit more money. 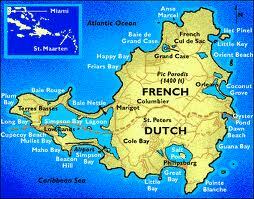 From the Dutch side you can grab a Fairy to the Islands of St. Barths and other surrounding Islands. 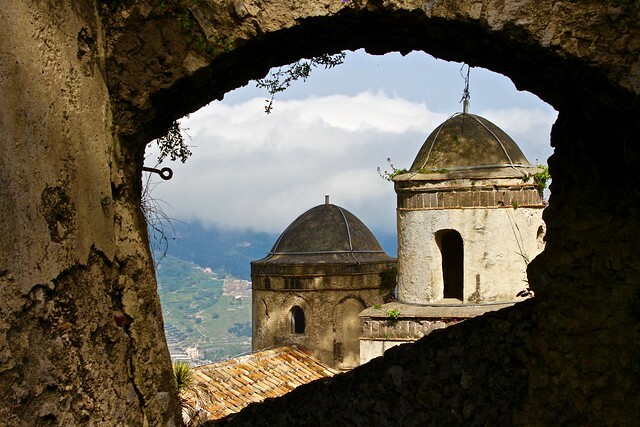 My post today is not about the Island per sei, it is about what it is like to get there. 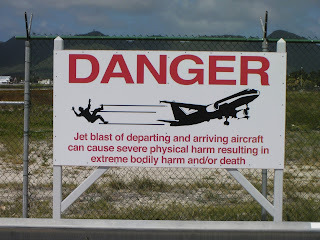 If you look at the Map above, on the dutch side, you will find Simpson Bay is sort of the entrance to St. Marteen, here you have Pricess Julianna International Airport. I would bet that you have seen pictures of planes landing at this airport. Maho Beach, this is a beautiful little beach/lagoon area with Resorts, Hotels, Shopping area and one bar called The Sunset. Now what makes this bar so special? Aside from the beer and rum punch, which by the way you can get anywhere on the Island. What don’t you get with any other bar is a close up view of Airplanes. I don’t just mean Airplanes sitting on the ground, I mean Airplanes landing. The Sunset, is a traditional beach bar you could find anywhere on any beach in the world, only with planes flying by so close you feel like you can touch them. If your a plane junkie, this is your Nirvana. You can just sit back at the bar and watch this, wondering if you can reach up and touch the plane. As cool as this is, what is even more cool is when that plane takes off. I have been to this place at least a dozen times, and every time it is like I have never seen it before. I will be back again in September and I can assure you, I will be here watching these big birds coming in, of course I will be enjoying a Rum Punch while I am doing it. One day we are sitting watching the planes come in, and it is exciting and all. 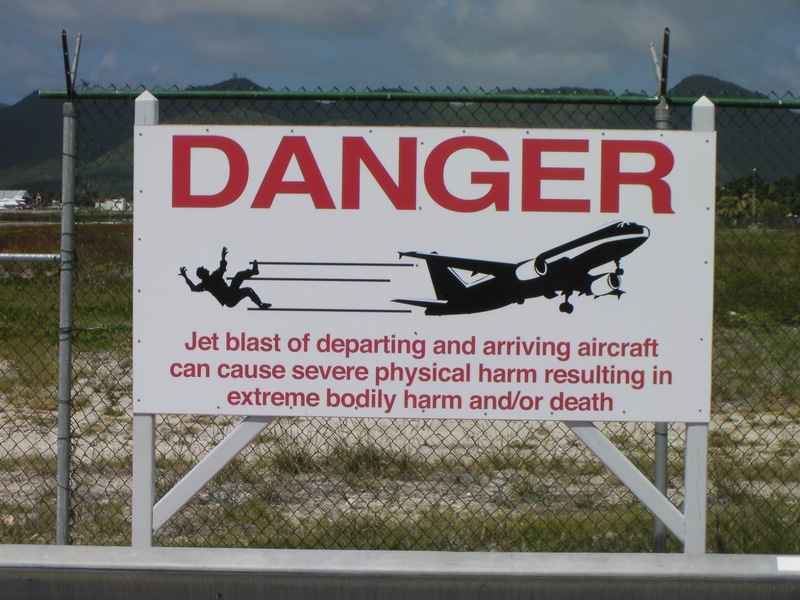 But when a plane is ready to depart the Island, look out. The people on the beach go wild. Let me set this up. The Beach is about 100 Yards from the end of the Runway, with nothing more than a simply fence and a small two lane road separating them. The beach is sort of a two tier sandy beach. 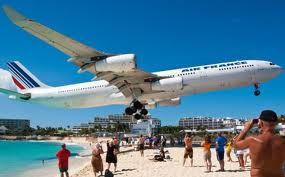 So one day we are watching a plane take off, and seriously there was a woman who really didn’t know what would happen and she was on the top tier of the beach, just nonchalantly walking along. Then all of a sudden, the Jet holds their brakes, accelerates and wham this poor woman was hit with a jet blast that blew her off the top tier to the bottom tier, from there she was blown straight in to the Ocean, clothes, purse, camera and all. Now we all laughed of course, but I am sure she wasn’t laughing. See for yourself. If your wondering, did Scott get behind one of these Big Birds and do this? ABSOLUTELY. And it was a Blast (pun intended) But I have to tell you, it is like getting hit with a ton of bricks, the heat from the engines is extremely hot, sand flying at dramatic speeds feels like having small boulders hitting you, and for days you are washing sand out of your hair. Would I do it again, heck yeah, can’t wait! In the future I will spend more time telling you about the Island, one of my favorites for sure, but today, was just about this awesome and fun experience of watching these planes and ridiculous people like me. It is an easy Island to get to from Phoenix or anywhere frankly. All the Major Airlines service this Island, the people are nice and there are plenty of places to stay.